The C.Scope 33kHz General Purpose Sonde is a transmitter used to trace the direction of pipes. 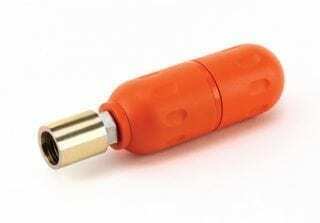 A C.Scope 33kHz General Purpose Sonde is a small battery powered transmitter hermetically sealed in a robust torpedo shaped case which which can be screwed onto the end of a drain rod and fed into a pipe. The pipe direction can be then be traced using a C.Scope Locator set to Generator/ Transmitter Mode. The location of a pipe blockage can be identified using this system with enormous cost saving potential. Orange case to identify the 33kHz version. 33kHz transmit signal allowing detection and tracing. Fully weatherproof design to IP65. Adaptors available for different Drain Rod types. 5 – 7 metres dependant on Locator. 1 x AA (IEC type LR6) typically giving up to 50 hours intermittent use at 20C. The C.Scope DXL4 is a dual-frequency (33+131kHz) Cable Avoidance Tool with Depth Measurement. In-built Data Logging as standard. Bluetooth™ connectivity and GPS tracking options available. Designed for use with an SGA4 or SGV4 Signal Generator. Network Rail Approved. The C.Scope 33KHz Duct Sonde is a transmitter used to trace the direction of small and congested ducts or conduits. The C.Scope Metal Pipe Sonde is a small, self-contained low frequency transmitter that can be used inside metallic pipes. The C.Scope 8kHz General Purpose Sonde is a transmitter used to trace the direction of pipes.